Home Changing the World Raising Money for a Cause? Give Up Your Birthday! Sometimes, changing the world costs money. Your project may be to raise money to donate to a cause, or you may be completing a project that requires you to buy materials or pay to ship goods somewhere. As kids, we don’t always have access to the funds needed to do this, so we turn to others for help. Raising money is an important step in making a difference, and it can be simple and fun to do. I did this by “giving up” my 16th birthday so that others may have clean water. In lieu of presents, I asked my family and friends to donate directly to a campaign I set up through Charity: Water, an organization working to bring clean drinking water to developing nations. Water is the world’s most basic resource, but millions of people are dying from the lack of clean water, so it wasn’t even a question if I was going to do my part to help. Once I spread the word, there was an overwhelmingly positive response. Hundreds of donations came pouring in from friends, family, and even complete strangers. Family and friends had shared it with every one they knew, and the campaign reached people all over the world- something I could have never even dreamed of. I had originally set my goal at $500, which is 1/10 0f the cost of a well. Everyone wanted to pitch in and help- my little brother emptied his piggy bank to donate and my sister donated three times to help me reach my ever-increasing goal. 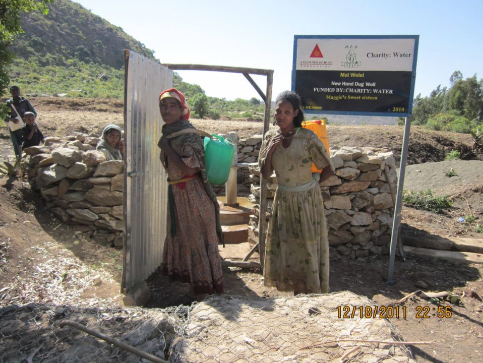 The campaign gained so much momentum that we ended up raising over $5,700 to bring clean water to the village of May Wel El, Ethiopia, a community of 300 people. I was overwhelmed by the success of the campaign; it was refreshing to see that so many people would rally around a good cause. Throughout the weeks around my birthday, my friends kept saying that they didn’t understand why I didn’t want presents. But this was my present. Sure, clothes and shoes are nice but I would forget about them in a few months. But the picture at the top of this post, of women drawing water from the well that my friends and family funded, is something I will carry with me for the rest of my life. For me, this was something so simple to do, yet it made an enormous impact in the lives of 300 people. All I had to do was dream big, and share my passion with those around me, and I saw tremendous results. Not only does it feel good to know that people on the other side of the world are drinking clean water because of an idea I had, but it reminded me of the power of young people to come together to change our world. Next articleWhat’s More Awesome Than Chocolate Bars? Maggie is an elementary school teacher. She has been an assistant teacher in first grade classrooms in Boston Public Schools an is now relocating to NYC. She is a recent graduate of the Lynch School of Education at Boston College, where she obtained a B.A. in Elementary Education and a Masters in Special Education.